Sleeve notes in English, German and Finnish. Lyrics in original German and English translations. Ondine is proud to release these world premiere recordings of two new Zemlinsky arrangements by Richard Dünser (b. 1959) with Lapland Chamber Orchestra conducted by John Storgårds. The works of Austrian composer Alexander Zemlinsky (1871-1942) - much admired by composers such as Mahler, Schoenberg and Berg - have gained more attention during the last decades. He wrote only 27 works with an opus number, but several of them can be considered among 20th century masterpieces. In 2013 composer Richard Dünser (b. 1959), pupil of Francis Burt and Hans Werner Henze, made two new rich arrangements of works by Zemlinsky. Seven Songs of Night and Dream (Sieben Lieder von Nacht und Traum) is an orchestration of songs from opp. 2, 5, 6, 8 and 10 based on the themes of night and dream. In this recording the songs are sung by mezzo-soprano Jenny Carlstedt. Chamber Symphony is a 40-minute orchestration of Zemlinsky's String Quartet No. 2. In this orchestration the limitations of a string quartet is set free by using a larger ensemble. Zemlinsky's String Quartet contains references to the works of his most famous pupil, Arnold Schoenberg. 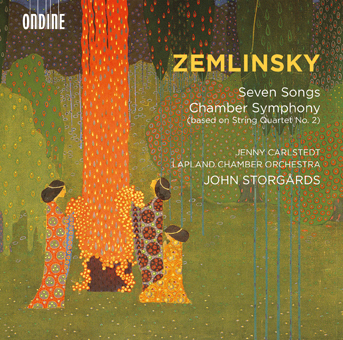 This release is a second Zemlinsky recording by John Storgårds on Ondine. John Storgårds, one of Finland's exceptional artists, has taken the classical music world by storm in recent decades. Since 2008, Storgårds has been Chief Conductor of the Helsinki Philharmonic Orchestra and Principal Guest Conductor of BBC Philharmonic Orchestra since 2012. The latest releases by Storgårds on Ondine include the complete symphonies of Leevi Madetoja (ODE 1211-2, ODE 1212-2), the Shostakovich Violin Concertos together with Christian Tetzlaff (ODE 1239-2), discs of works by Zemlinsky (ODE 1237-5) and Rolf Wallin (ODE 1267-2D) and two recordings with soprano Soile Isokoski (ODE 1252-2, ODE 1261-2).